Is your company or organization looking to become involved in the trade show circuit? A pop up banner just might be what you need! The proper advertising equipment is necessary for creating larger contact bases, marketing goods and increasing profits. 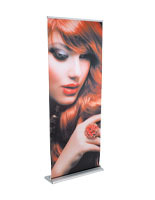 This affordable printed pop up banner is offered in several styles and dimensions to suit the applications of any association. What is even greater is that most models are customizable with customer-submitted graphics, which allows users to expand brand awareness or showcase sponsorship with ease. 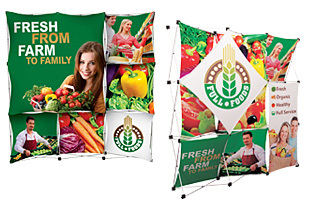 The pop up banner is available in many layouts, including retractable, portable, A-frame, backdrop and tabletop configurations. Implementing the most impactful signage material at tradeshows is imperative for any business, which is why the e-store supplies so many options. 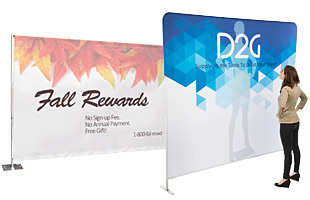 Displays2go.com provides this pop up banner, as well as printed murals, exterior signage, rollup pennants and booth wall units all at wholesale costs. Loads of institutions, businesses and organizations have already taken full advantage of these remarkable fixtures. This pop up banner, commonly known as an expanding sign, is usually printed with graphics, slogans or other messages that help target specific audiences. Utilize them throughout conventions, assemblies, fairs and more. Peruse the catalog to find the items that garner the most exposure in any environment! This pop up banner will add to your exhibits while informing viewers or prospective customers. The right hardware allows companies to extend their scope. It is simple to understand that the corporation with the most involved participants and clients is frequently the most victorious out on the floor. Supplementing existing units with a pop up banner speeds up the process of sharing informative material. Catch the attention of visitors before others do with high flying pennants, commercial flags or extra tall free-standing signs. High impact demonstrations have become the standard within the trade arena, as most tower over rival establishments. It is important to note that they are not only intended for conventions or even inside use. Outdoor a-frames, especially those with distancing straps, are idyllic for sports tournaments and athletic competitions. Corporate sponsors want to be a presence, and these vinyl signs are just right for that purpose. Because our distribution center is so well stocked, only the most favored models are available to pick from. 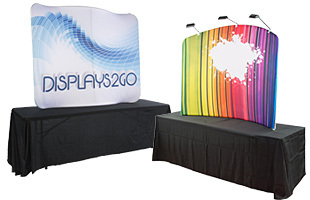 What are some of the different types of pop up banner displays currently for sale? 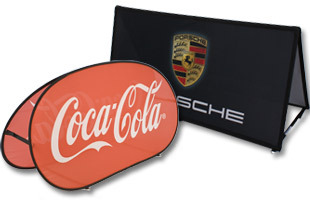 High resolution trade exhibits offer an innovative way to present lifelike graphics at any promotional event. A booth can be used as a backdrop for expositions, press conferences and more. Each features a lightweight expanding frame for fast and easy setups. These displays are assembled in less than 10 minutes and pack down into supplied carrying cases. 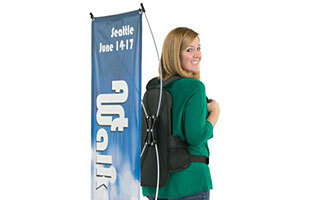 Lightweight banner walls provide massive impact at conventions, exhibitions and other marketing affairs. These wall systems, also known as murals, have portable designs ideal for traveling. The uncomplicated designs of these large walls make them a hit at every convention. 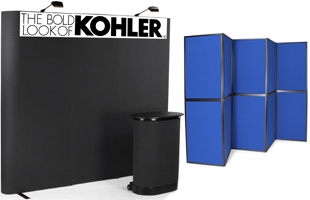 Complete trade show booths are simple, economical and customizable solutions. 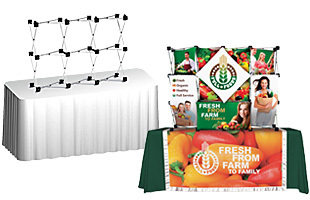 Trade show booths allow for quick creation of a backdrop to showcase specifications or information. Some are hook & loop-receptive, so charts, literature holders and other accessories attach and detach within minutes. Similar styles are manufactured from fabric rather than touch fasteners, like hook & loop materials. 3-D displays are an exciting and new method for publicizing indoors! 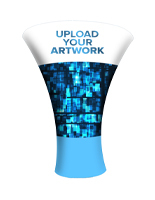 Leave a lasting impression with custom images that literally pop out. 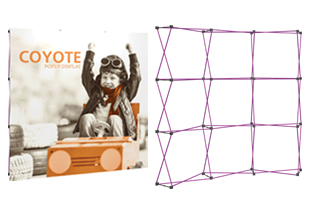 Each has a lightweight aluminum frame that is durable, stable and simple to setup. Tension fabric panels come pre-attached, so setup takes less than a minute. Simply raise the frame from the ground, and the magnetic connectors will automatically snap-lock into place. A full color tabletop display upgrades boring booths. While everyone else has a solid fabric or cardboard display, your exhibits will stand out with vivid coloring. The manageable frames enable the tabletoppers to be transported fast while the fabric remains attached to the frame. Other countertop styles have 3-dimensional graphics. 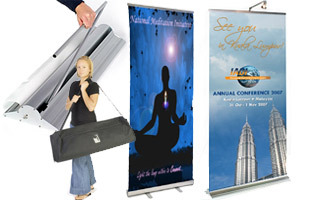 These banners are commonly used at large-scale, public events to attract attention. Salespersons find that they are able to provide interesting, graphical components while presentations are given. Studies have shown that pictures and images, especially with full-color printing, are most useful for attracting and holding the attention of consumers than boring data or pushy advertising ploys. 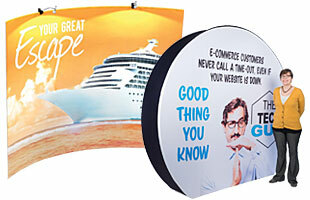 Popup banners in A-frame designs take marketing outside! This signage collection allows for communication to an intended audience. Whether showing a brand name or logo or description, these A-frames are extremely lightweight yet offer portability and are designed to withstand most moderate outdoor conditions (not recommended for use in high winds or severe weather). They are also fine for indoor events. More sophisticated choices include our Expand® rollup stands. Although they have a higher initial cost, these retractable models are worth every penny. Their sleek and portable style combined with enclosed carry bags definitely make them champions of the road! 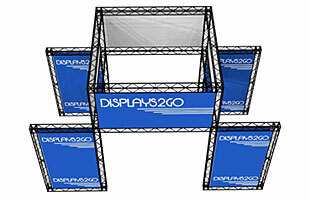 Economy stands, like retractable exhibits, are suitable for tradeshow applications. Their vividly colored images are heavily favored by expo pros, as they successfully appeal to potential customers of every age. Traveling vendors prefer models that are affordable because they often purchase more than one unit to create dynamic themes. Portability is, of course, a standard trait of these items. You may also like backdrops with printing. We offer an 8 foot and a 10 foot mural that both serve as educational tools. Presenters favor these units because they let viewers easily identify what an exhibit is all about. What characteristics define these pop up banners and how do they compare to other designs on the market? These portable booth displays are usually combined with tailored images or text that permit organizations to target particular demographic groups. Devise solutions that describe the detail of different options. Accurately explaining procedures or merchandise is crucial. The portable designs of these advertising signs are easily taken down and weigh very little. Any graphics supplied by our company are lightweight, as well. Moreover, tote cases are included with many of the offerings, which help make transport effortless. These stands are each equipped with the features that pull pennants straight and readable. If customers cannot decipher your messages, then all is lost! The materials used to manufacture the items are strong and engineered to avoid wrinkling. Curl resistance is a basic amenity of most every sign. Maintaining a professional appearance while traveling can be hard, which is why we provide only professional models! 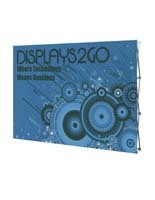 Displays2go.com is a leading digital printing manufacturer that specializes in great resolution. Our warehouse offers lots of choices, including tabletop, retractable, portable and other advertising displays, as well as hardware. If you have any questions concerning your order, our customer service reps are available Monday through Thursday from 8 a.m. to 6:30 p.m. and Friday from 8 a.m. to 5:30 p.m. EST. You can also dial 1-800-572-2194, or while online, you may participate in a live chat with one of our friendly experts. If you are unavailable during our hours, just send an Email, and we will respond as soon as possible. With our fully-stocked, on-site facilities, we can supply same-day shipping on many items, excluding those that are custom printed. If your order is in stock and is placed before 3PM EST, it will ship the same day. Same-day shipping is not offered on freight-shipped orders. When you peruse the virtual warehouse, you will notice that only the most sensible, portable and affordable advertising booth selections are offered.